1. Complete the form below filling out all repair information and upload pictures. Uploading pictures is not required but will allow us to provide you an estimate quicker and more accurately. 2. 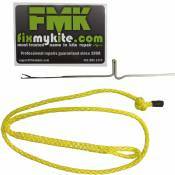 FixMyKite.com will email you with an estimate once we have reviewed your repair ticket information. 3. Please print your repair ticket and ship it with your kite. 4. Ship your kite only (no bag or *bar) and in the smallest box possible. This will save money on shipping. Please note: You will not be charged to create a repair ticket.